When I searched for “vegetarian friendly dinner” in the financial district of San Francisco, one restaurant that caught my eye was Cotogna. Its colorful website was bursting with pictures of fresh vegetables, so I didn’t have to feel silly about calling them and ask if it was a good idea to take a vegan there. It just so happened that the night we were dining there was also a Sunday Supper night, which I was looking forward to. I had the regular set for Sunday Supper while Will had a modified vegan set. I didn’t get to take too many pictures because I was both starving and trying to hold an active infant in my lap for the start of the meal. Luckily, the staff was nice enough to borrow another highchair from a nearby restaurant so that we could put Robin in it and eat like somewhat-civilized people. Robin seemed to enjoy the food as well. One thing Cotogna is known for is their fresh pasta and it did not disappoint. My taglioni was the perfect amount of al dente — I expected no less. What really impressed me was that they had to use dried pasta for Will’s dish since most fresh pasta isn’t vegan and even their dried pasta dish with tomato sauce, which sounds boring, was really good. Will declared that he would be happy to return to the restaurant soon. 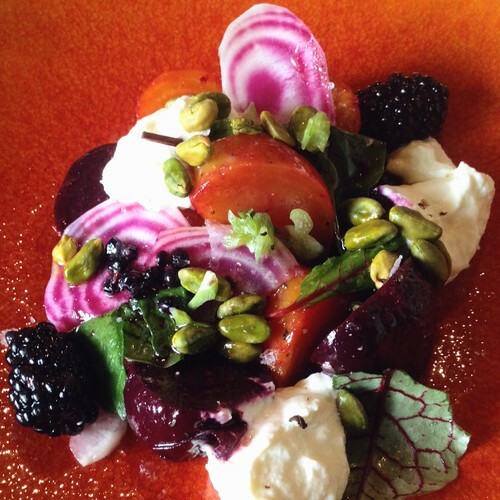 There was also a beet salad appetizer. While it was good, it didn’t blow me away. I’m just bored of beet salad. 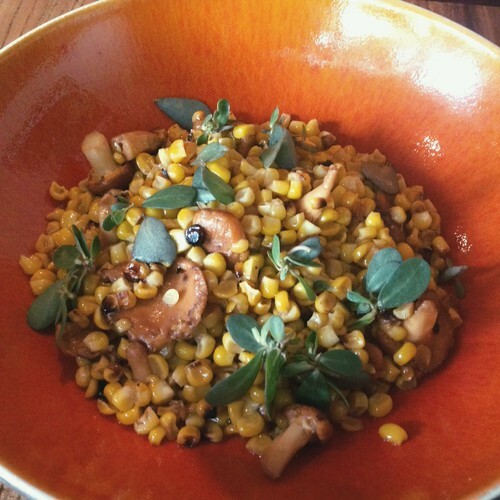 In lieu of a meaty protein dish, Will got this hearty bowl of fresh corn and chanterelles. He really enjoyed this and was happy it wasn’t yet another salad. The only odd thing about this dish was the choice of purslane for garnish. It made the dish look pretty, but the lemony taste of the purslane didn’t really mesh well with the rest of the elements in the bowl. I had the same thought about the fennel fronds in my lamb dish. 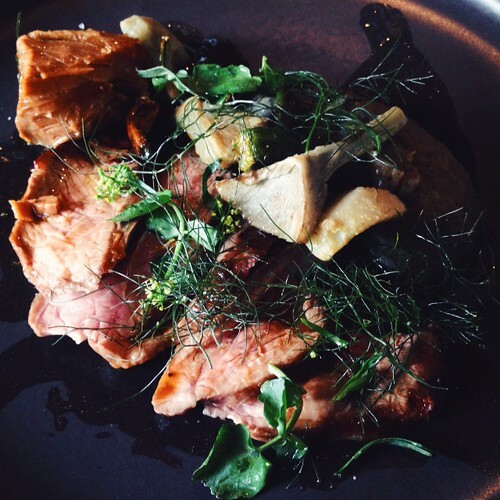 Other than the odd taste of the fennel in the lamb, I enjoyed my meaty main. The lamb was not overcooked and the eggplant puree served with it added the necessary pop of flavor to an otherwise heavy bite. Since I picked Cotogna because it was vegetarian friendly, close to our hotel, and had something special for Father’s Day, I have to say it was a hit. It could be the Aperol flip that I had to start with, but I also thought the wine selection by the glass was both interesting and reasonably priced. The only downside to dining at Cotogna is that it’s going to be hard to decide between eating there or Barbacco next time I’m in SF and want that type of Californian-Italian food for dinner. After passing by this place several times on our way Pizzanista! I finally convinced Will to take me to Bestia. We were apprehensive because the chef also used to work at Osteria Angelini, where I had the most underdone plate of pasta in my life. My pasta at Angelini was not a “Oh, this must be al dente” underdone. It was a “Oh, my pasta is crunchy and still half white inside” underdone. Perhaps I don’t know how to appreciate a properly al dente pasta, but I was not a fan. Fast forward to last night, where we had a 9:30 reservation for Bestia. The restaurant is tucked away in an odd parking lot where if you hadn’t known it was there, you’d think you were parking to score some drugs or bootleg something. Stepping into the place, we were accosted with smoke in the air. Was the kitchen on fire? No, it must be usually like this because no one else seemed alarmed at how smoky it was. Or maybe we couldn’t hear the cries of alarm because it was just so darn loud. I literally had to yell across a 2-seat table to Will in order for him to hear me. When we sat down and looked at the menu, we were surprised to read something we must have overlooked on the menu online. No substitutions or modifications. Uh oh, this does not bode well for the vegan. Luckily, our server and the kitchen was really understanding and let us leave off the dairy and other un-vegan ingredients in some of the dishes. We started with some cured olives which were fine. The addition of fennel or cumin seeds was a nice touch. 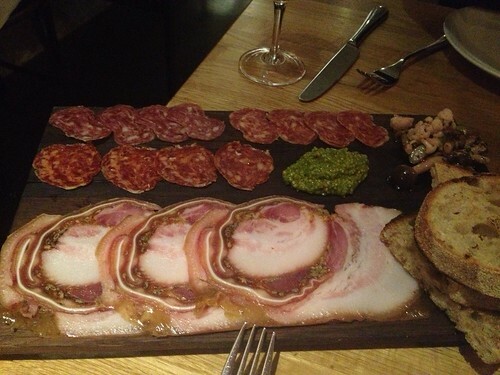 I ordered the house-made salumi, which included head cheese and three other slices of cured meats. While they tasted great, I couldn’t taste much difference between three of them. Other than the color and shape, they seemed similar to me. I did enjoy the spicy house-made mustard and the pickles. It’s not every day you have pickled nameko mushrooms. And the grilled bread! It had been a while since I had a nice piece of grilled bread. 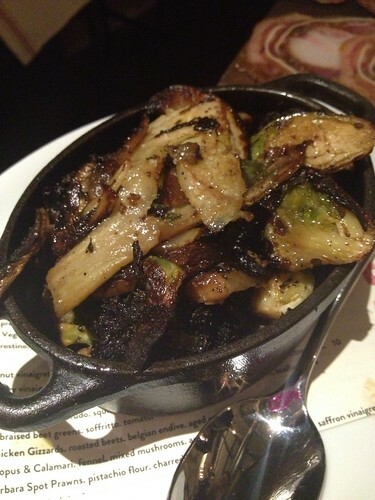 We split the roasted vegetables (broccoli, brussels sprouts, cauliflower, fennel, potato), which had a great char on them. My chief complaint about restaurant roasted vegetables is that they’re often underdone. 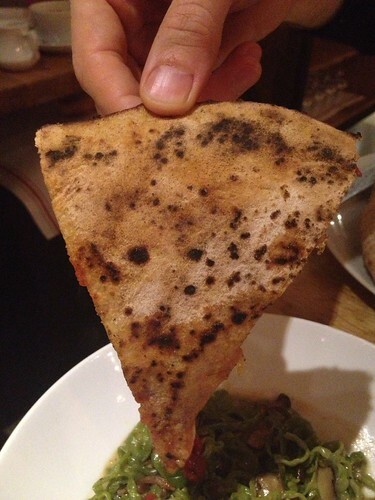 This was not the case at Bestia. These were roasted to perfection, but a little too oily. Although I was fearful of ordering pasta, I couldn’t stop myself from ordering the stinging nettle pasta with mushroom ragu and a poached egg. Boy, am I glad I did. The pasta was topped with a few dehydrated leaves of curly spinach that were crunchy and had a seaweed-like savory flavor. 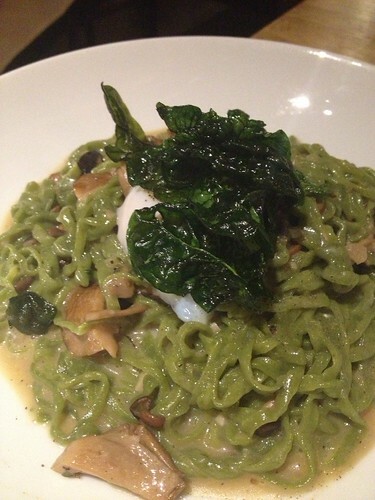 The pasta was cooked perfectly with the stinging nettle giving it a characteristic green color. 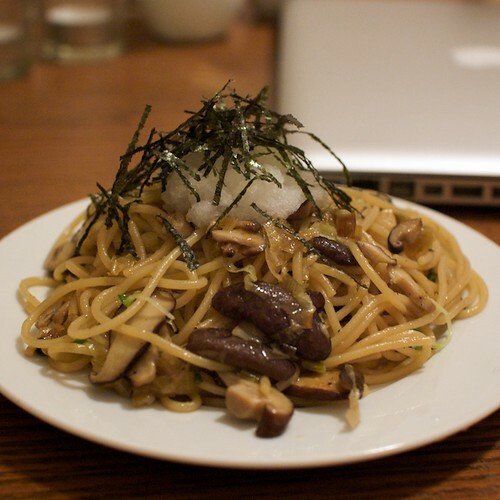 The mushroom ragu tasted incredibly earthy and creamy. The star of the dish was the perfectly poached egg. The white was creamy without being slimy, and the yolk ran down my pasta in rich rivulets of gold. What a great sauce that made! I’m still kicking myself for forgetting to bring the leftovers home. Will got the burrata pizza without the burrata, so it was more like a tomato sauce and olive pizza. The crust was charred well without being too burnt. I liked the way the tomato sauce tasted along with the briny green olives. I can see this being a hit when it’s being served with burrata on top. 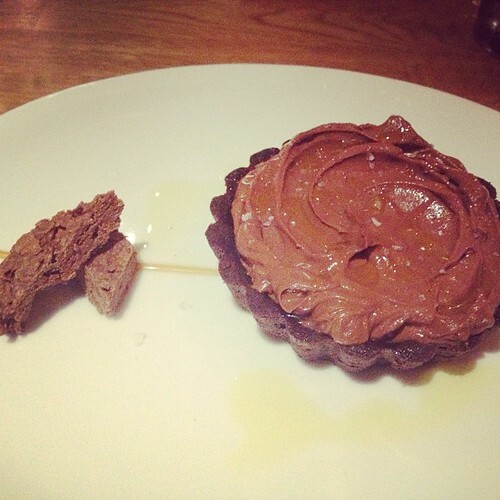 Even though I was stuffed to overflowing, I couldn’t turn down the chocolate budino tart. I loved the chocolate wafer-like things it was served on the side with. I loved the dark, bitter taste of the crust. The actual budino part, I could have skipped. It was no comparison to the budino at Mozza. Along with our meal, we ordered cocktails. 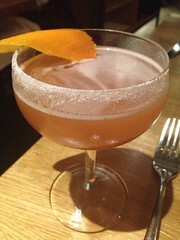 Will got a sidecar variation that was balanced and therefore very drinkable. 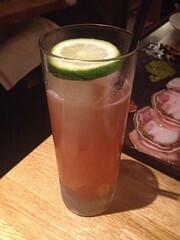 I requested a pregnant-lady-friendly, low-alcohol cocktail and was presented with a campari, white wine apertif, and soda water concoction that was very refreshing, if not a little strong. I liked the slice of lemon balanced precariously on my long ice cube. I admit to diluting it a bit with more soda water and drinking only half, but it was delicious. I’m glad we got over our fear of undercooked pasta and underwhelming dishes to finally try Bestia. I only wish it wasn’t so loud and smoky in there. 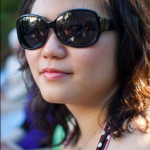 I emerged smelling more like smoke than I do when marinating for hours in a KBBQ restaurant. If you’re fast with washing and chopping vegetables, the topping and ‘sauce’ part of the pasta will be done by the time the pasta has been boiled. This one takes some prep work, but luckily I already had a big bowl of beans cooked up from the weekend so it just took me an hour to throw it together. 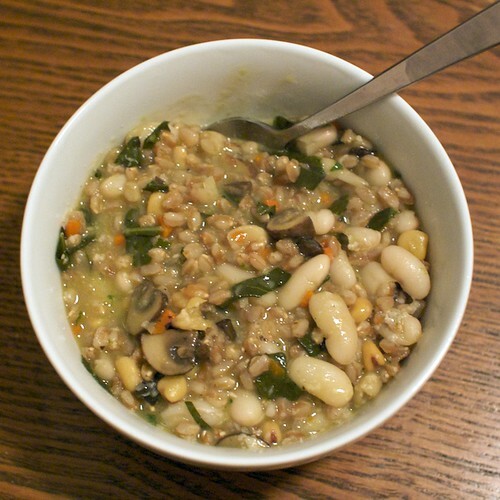 Shout-out goes to the Italian mama-san I met while picking farro and beans at Guidi Marcello’s who gave me this recipe. She told me one of her favorite things to do with farro is to cook it up with cannellini beans, chickpeas, and then stir in some pesto. I improvised on that and made a creamy, hearty, risotto-like thing. I may write up the recipe later.